The international community is challenging the reasoning in the decision of US President Donald Trump to withdraw the US from the Paris Climate Agreement, as he stated that “from today” the US is interrupting the application of the non-binding terms of the treaty. The treaty is known as the Paris Agreement (COP21) is a global agreement on climate change which was reached on December 12, 2015 in Paris. It is an action plan to maintain the amount of global warming to below 2 °C from 2020 onwards. Greece’s wealth is inseparable from its climatic conditions. The warm dry summer climate combined with the thousands of miles of coastlines magnetize tourists from all over the world. Hot summers, combined with mild winters, favor the development of agriculture as an integral part of the economy. Under the same climatic conditions, thousands of hectares of forests cover the country and harbor a great biodiversity. Today, this natural wealth is under great pressure due to population growth and unpredictable growth. Global warming will still cause great pressure in our country. A UN study shows that Greece as well as the entire Mediterranean is among the 18 hot spots on the planet that will face the biggest problems due to the growing climate change. 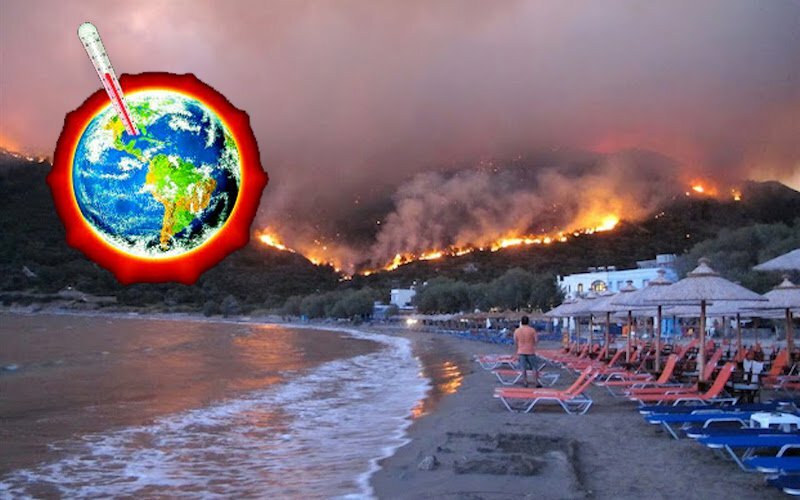 WWF Hellas research, in collaboration with the National Observatory of Athens, titled “Tomorrow Greece”, tries to predict the climatic conditions in Greece between the years 2020 to 2050. According to the results of their survey, the existing discomfort of urban residents will be intensified. Residents of cities such as Thessaloniki, Patras, Lamia and Larissa will be subjected to up to 20 more heat wave days. At the same time, in Lamia, Larisa, Volos, Thessaloniki and Athens, the total rainfall will decrease, but the extreme rainfall is expected to increase by 10-20%. In other words, the risk of both flooding and fires spreading in forests is increasing. The tourist destinations of our country will also be significantly affected. Also, 5 to 15 more days will register as hot-weather days at tourist destinations, while the night temperature will increase, with temperatures not falling below 20 °C, especially on Rhodes and in Chania. The country’s ten largest rural regions will also be under pressure from climate change, resulting in increased heat during the days, consecutive days without rain, reduced winter rainfall and hence greatly increasing the risk of fire. For example, over 25 extra dry days are expected in Evia compared to today, while Serres and Larissa will experience 20 times more heatwaves than now. Also, in Heraklion and Pella the rainfall in winter will drop by 15%. Furthermore, there is an increased risk of desertification of new land and a decrease in water availability. Climate change is expected to put a lot of pressure on the National Parks as it is planned to increase the days at high risk of fire in all the country’s forests. Finally, in a related report published in 2011, the Bank of Greece points out that the economic cost of climate change for our country is extremely high: in the worst case scenario, the total cost to the Greek economy by 2100 amounts to 701 billion euros, more than twice as high as our national debt in 2009. The editors of the report note that the adoption of climate-friendly policies is the most cost-effective option we have. As Greece reduces emissions dramatically, in a similar global effort, total costs are reduced by € 265 billion to € 436 billion.